I am normally a very laid-back person. If something bothers me and I can’t fix it, I take a tip from my dog. I kick a little dirt on it, after marking it for later reference, and then move on. Some things are harder than others to move on from, though. One of my biggest pet peeves is people who go out of their way to bring a little gloominess to everything they touch. When I encounter them, I try to remember that negative people are simply that: negative. They’ll find fault with anything and everything. I can usually just do the dog-thing and kick a little dirt on the situation and move on, but not when it comes to friends or family. If you know me, you’ll probably remember that I am very passionate about the Haunted Victorian Mansion in Gardner, Massachusetts. I visit any chance I get. I am peculiarly drawn there. I just can’t seem to stay away. A lot of my fixation involves the house itself. Built in 1875, the Second Empire Victorian style mansion is beautiful in detail and rich in history. The nine-foot tall mahogany doors lead to a luxurious interior that was state-of-the-art for the late 1800’s. The house boasts two cisterns that once collected rainwater from the slate roof, providing the occupants with running water. The hand-carved moldings and cornices speak volumes of a time when houses were built slowly and lovingly. A sophisticated call-system was wired through the house, allowing people on one floor to communicate with those on other floors. Famous people frequented the mansion back in its heyday. Minnesota Fats played pool there. The likes of Bette Davis, PT Barnum, and Norman Rockwell were frequent visitors. President Calvin Coolidge even spent time there. Walking through the doors is like traveling back in time. The house is owned by two of the nicest people I’ve ever known. Edwin Gonzalez and Lillian Otero are very warm and welcoming. From the first time I met them, and they greeted me at the door with hugs, I knew they were special people. Over the years, they’ve collected a group of friends, who fondly refer to themselves as the Victorian Mansion Groupies. We help out with investigations and fund-raisers, and anything else that needs time and attention. Heading up this group is Marion Luomo, the Victorian Mansion Caretaker. She tirelessly tends to the house while the owners are away, checking to insure the house is in good order, and often opening up the house for investigations and tours. She is often joined by Tina Aube, who is just as addicted to the Victorian Mansion as I am. Our friend, Sandy MacLeod joins us on occasion, as does NE POST founder, Christopher Cox, and co-founder, Christina Treger Achilles, who are pooling resources for repairs to the house. Together, we all have a mission: to save the Victorian. The Victorian has fallen on tough times. 138 years of freezing and thawing, pigeons, hurricanes, and blizzards, has taken its toll on the house. The gables are pulling away from the building, and the slate roof has been leaking for many years, threatening the entire structure. Chris Cox brought in a contractor for an evaluation, and the news wasn’t good. If the house isn’t repaired, it might not last another year or two. 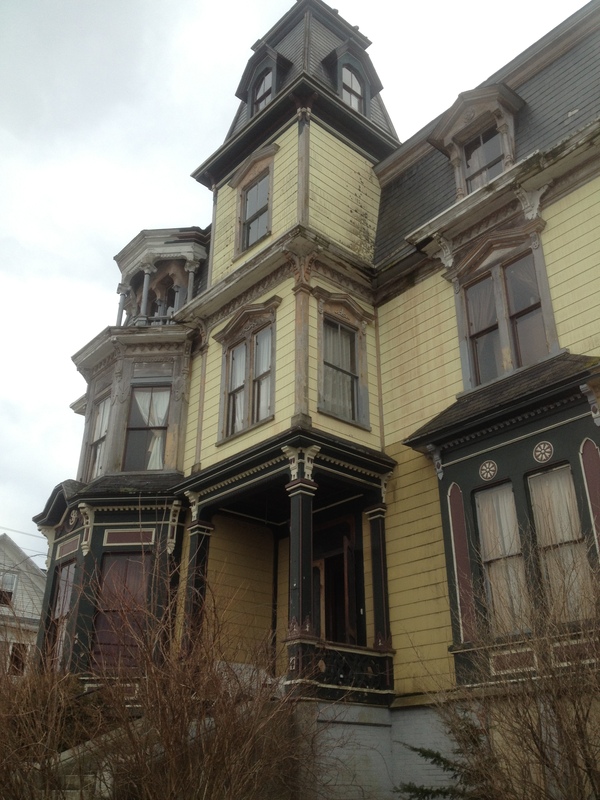 Anyone who owns an old Victorian knows they can be money pits. When Edwin and Lillian first moved in, they spent money hand-over-fist, fixing the plumbing, trying to get the fireplaces to work safely, updating the electrical, and a host of other repairs. Any money they received from tours and investigations went almost directly to the repairmen. When the house became too paranormally active to live in, they were forced to move closer to Boston, where they share a small space at Lillian’s sister’s house. At this point, they could have sold the house. They could have put it on the market and taken a financial hit for all the money they’d already invested into it. But, like many of us, the house had a hold on them. They loved it and wanted, if nothing else, to save it from total ruin. They just couldn’t walk away and leave it up to fate. Nearly every penny they receive from investigations and tours goes right back into the house. Besides the expensive repairs, they have to pay the mortgage, the electric bill, town taxes, and insurance. They do this for a house they can’t even live in, while maintaining a separate residence nearly fifty miles away. When the house appears on a paranormal show, it brings more interest. More people want to tour it or investigate it, bringing more money for the repairs that are desperately needed. And some people have criticized them for it. They say they’re exploiting the spirits, while raking in tons of money and enjoying their fame and fortune. Those people have never seen Edwin and Lillian drive up to the event in their old Honda, or understand that they now live in a room that is smaller than any one room in the mansion they own, but can’t live in. They’ve never seen them break down in tears when talking about the events that led them to flee from their own house. They’ve never seen the love in their eyes as they talk about their beloved Victorian. Everyone is entitled to their opinion, of course. Some say the house is filled with ghosts, while others proclaim it to be ghost-free. If you lived it from the inside-out, you would probably have a different take on the matter. Imagine being pinned to your bed with invisible hands, waking up to find a woman standing by your bedside crying. What would you do if your doors slammed on their own accord, while you listened to footsteps walk around your bed while you tried to sleep? What if you were overtaken by something you couldn’t explain, waking up days later with little knowledge of what transpired? Would you really want to stay there? I’ve spent the night there twice, and I can tell you that it wasn’t a pleasant experience. While I love the house dearly, I’d never want to live there. If I had the opportunity to seek help, or at least have some of my questions answered, I too would turn to people who could possibly offer assistance. The problem is: who do you believe? Not all the people invited to the mansion are there to investigate. Some have been called in to help. Multiple people have blessed and cleansed the house. Others have offered answers to some of the questions plaguing the owners. In the paranormal field though, answers are never cut and dried. Since there aren’t any rule books on the subject, all of the information being provided to the owners has been varied, and not always helpful. Some have caused more harm than good. Others have tried to fix this, only to make it worse. For the moment, the house is much calmer than it’s been in years, but that isn’t guaranteed to last. As we all know, change often happens quickly and without warning. So, please…be more considerate. Remember that this is a house that needs help. Sponsoring paranormal events brings money which is needed to fix the house. If the house isn’t repaired, it has only a few years left before it will fall into a swift decline. It is a piece of Gardner history, a treasure that is precariously hanging by its last hope. If having it featured on paranormal television shows helps this house stick around another hundred years, what harm is it doing to you? If you have ideas that could help Edwin and Lillian, by all means, please share them. We all love that house and want nothing more than to see it transformed back to its former beauty. Now, I’m going to kick some dirt over this and move on. I have another book to write. For more information about the SK Pierce Haunted Victorian Mansion, please see their website: hauntedvictorianmansion.com or find them on Facebook.